Likes: Like a cigar on the beach! 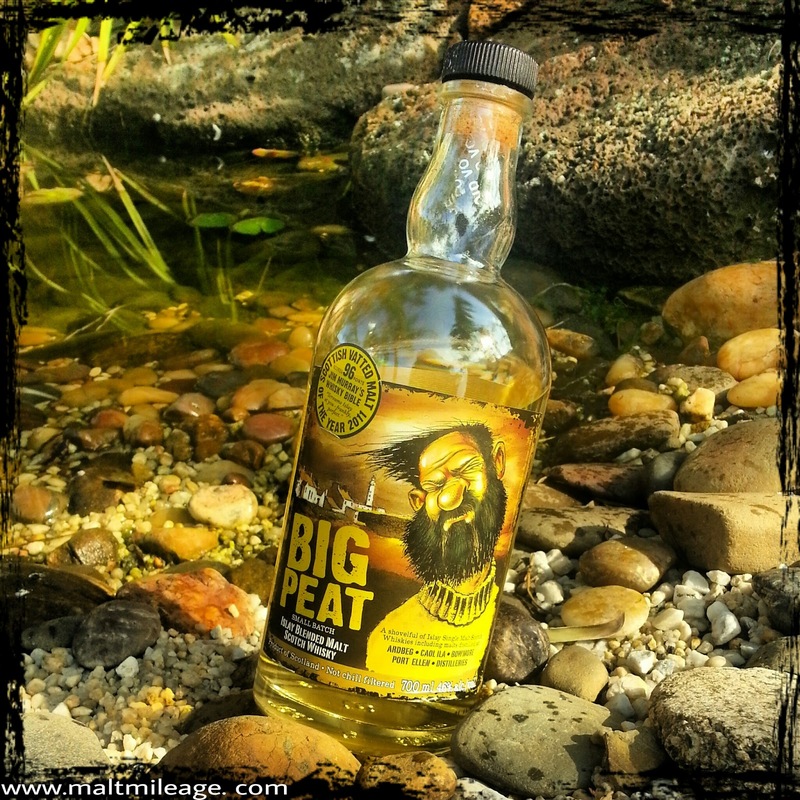 The burly lad pictured on the front of this bottle is Big Peat, who appears to be getting a punch of salty sea air. That encapsulates the essence of this whisky. It is not for everybody, because it offers a distinctive beach theme with lots of peat and a few fumes of smoke. The smell of the sea thumps the nose with saltiness, an ashy campfire on a sandy beach and waves of peat and smoke. This character moves onto the palate, though it is a little more bitter with more dry peat and a shimmer of sugary sweetness which then turn into a cloud of dense cigar smoke for the finish; just like having a cigar on the beach! This vatted malt has a thuggish peat punch. Its colour is very light, almost a pale straw or chardonnay. The problem with this whisky, though, is precisely its peaty strength which can get overwhelming after a while. It strikes the nose with a gust of smoke, like burnt grass and twigs, and this really is nice for a short while but it may not be for everybody. There is a beautiful sweetness in this whisky that deserves exploring, but I discovered it after some unpacking. Part of the Douglas Laing family, Big Peat is a “vatted malt” with a selection of single malt whiskies from Ardbeg, Bowmore, Caol Ila and the now closed Port Ellen. It is very distinctive, and it has a spark of sweetness in the flood of peat and beachiness. On the nose this Islay blend of malts conjures images of campfires on the beach. It releases a smokey fragrance that warms the nostrils with peat and an unmistakable sea breeze; almost like smoking a cigar on the beach. The peat is strong and dry, with some wafts of dry grass adding earthiness together with sand. There is a sweetness in the fog of peat, but it is hard to put my figer on. The slight fire heats my tongue briefly and quickly dissipates as it warms my tongue and throat; then there is an explosion of cigar smoke. I pretend to blow it out, thinking back to my smoking days. This entry was posted in Malt blends. Bookmark the permalink.